Drafts from Around the World: Sept 28 2012 - St Petersburg Culinary Tour! Sept 28 2012 - St Petersburg Culinary Tour! Totally randomly we just happened upon the brewpub Yoksel on Marata Street. Despite being filled with cigarette smoke, I like the gritty real feel of this place. They don't brew on premises, but they assured us their beers are made exclusively for them. All the beers we sampled had heads that melt on your lips. Is this a sign of freshness? Or part of the fermentation process? I don't know, but it's a very pleasant surprise! We also tried Tyomnenkoe, described as a dark hoppy beer, I would probably label it as a dunkel lager. Bouquet is a good slice of toast, tastes like caramelized onion, aftertaste is kvas, which is a Russian fermented bread soda, not unlike a non-alcoholic beer. Browsing the Kuznechniy market - we bought great pickles!! 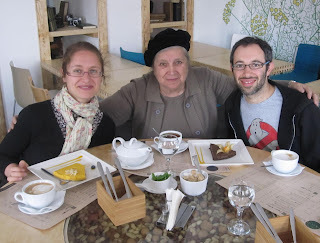 With a visit to the Dostoyevsky Museum and Kuznechniy market in between, we then headed to Ukrop (Dill) restaurant. 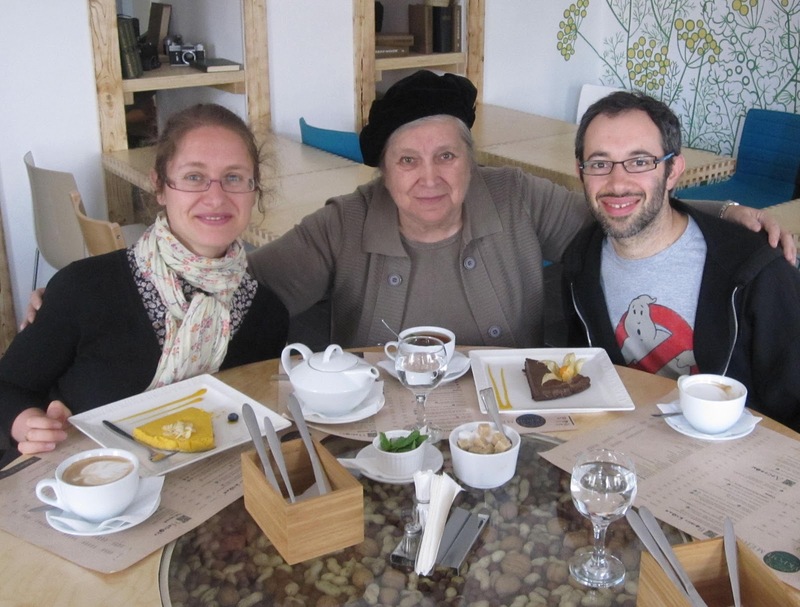 Having just opened for business yesterday, Ukrop is the only restaurant in St Petersburg serving raw food. Their raw specialties, combined with a variety of vegetarian, vegan, and gluten-free fare, along with their fun hipster atmosphere, makes for a great new culinary hotspot. Even Aunt Maya found something she liked at Ukrop! The asparagus soup is layered in such a way that first you experience the rich thick asparagus purée, then deeper you discover a layer of tiny cubed beets. You must try the cucumber salad, perked up with sesame oil and lemon juice. The mushroom pancake is a savory raw veggie patty crusted in sesame seeds. It's so fresh, you could eat it with a spoon! The desserts might be gluten free as their crusts are made with finely chopped almonds and dates. Everything, straight from the garden, is prepared in such a creative, healthy, and fun way that hasn't been tried before, even in Eden. On the way home, we stopped by the famous John Lennon Temple of Love, which was run by the consummate Russian Beatles fanatic Kolya Vasin, starting as a fan club in 1970, then becoming a full-fledged shrine in 1990. The Temple itself wasn’t open for visitors at the time, but the scene outside is really chill, with good vibes all around! Sept 25 2012 - Croatia in review! Sept 18 2012 - Ready to Split from Split?